One of the biggest questions we get asked time and again is if we think passengers should arrive the night before their cruise, or head to the port on the day of their trip. For those that are nearby (within driving distance), we usually think you are ok coming in the day of your cruise, unless there is some major reason such as weather to make you think that you need more time. However, if you are flying into the area then we highly recommend you come in the night before. Between long lines at security, plane breakdowns, and weather delays, there are simply too many potential issues that can come up and delay your trip. Of course, if you come in early then you’ll need a place to stay. To help you out, we’ve rounded up a number of options to stay before your cruise. Unlike some port cities, there are no accommodations right at the Port of Baltimore. Instead, the closest places to stay are located near the downtown/Inner Harbor area. This is about 10 minutes (3 miles) away from the port, which is a cheap and easy Uber or taxi ride. Some hotels will also provide a shuttle. 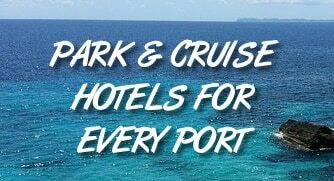 With this in mind, we’ve rounded up the hotels closest to the cruise terminal that are also rated “Good” or better by online booking site Kayak.com. Rates are for a recent search for a Saturday night stay. Your rate will vary. Click the hotel name below to read reviews from real travelers on TripAdvisor.com.